In Aramar suministros para el vidrio we are distributors of several professional brands of glass fittings, as can be seen in our catalog. Today we are going to talk about two big brands with great impact in the market of sliding doors with different designs that adapt to any style. Both Saheco and Hegox, are Spanish companies with extensive experience in the sector of glass fittings, which study and design new systems that provide more comfort to the consumer, thus creating multifunctional spaces. Adding great new features such as the different braking systems that allow greater safety and smoothness in the opening and closing of sliding doors that each has. Although in the catalogue of both brands you will be able to enjoy a wide range of products such as fittings for glass partitions, today we focus on their great capacity for development and marketing of air sliding doors, a booming market for the creation of optimized spaces where there is increasingly great diversity of designs to suit any style of homes, offices, businesses and others. That is why both brands adapt to the needs of the market and consumers, thus being great references in the distribution of this type of products. Among the novelties in the market, the Saheco brand presents a rustic range of wooden slides, with which it aims to recreate the beginnings of this type of product. 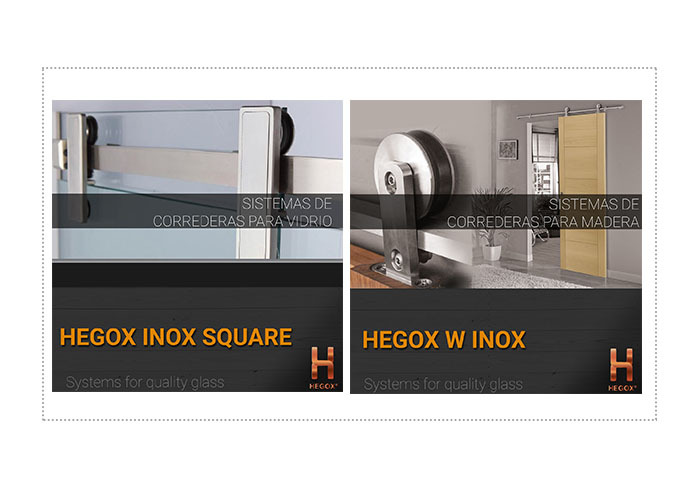 While the HEGOX brand, which is characterized by more competitive prices, presents an air sliding system within its range INOX, where the main feature of the system is the design of straight lines in which all components are visible, creating a fusion of rustic and elegant touch, between which you can choose two very particular styles, both with satin stainless steel finish. On the one hand we find the model for glass INOX SQUARE which supports from 60kgs to a maximum weight of 150kgs per sheet and a maximum thickness of 10mm for machined glass. While on the other hand, there is the model for wood W INOX which is also for a maximum weight of 150kgs for wood 35mm thick and with a rounded top profile with a diameter of 25mm. Ask us for any of the models available in our catalog, we will be happy to assist you.